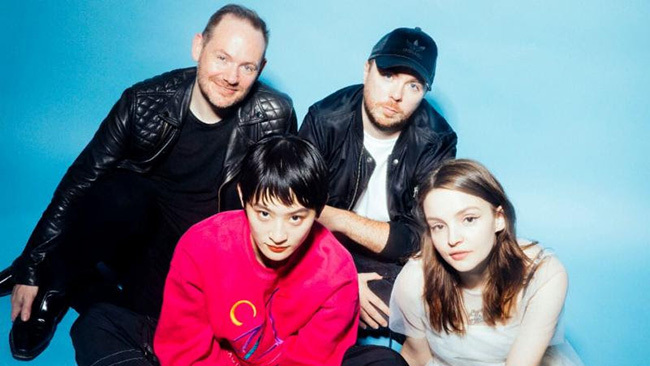 CHVRCHES Go J-pop on New Song, Teaming up with Wednesday Campanella for "Out Of My Head"
We know that “CHVRCHES” is pronounced “churches” and yet, every time it comes across our screen, a glitch in the system insists we hear “che-ver-ches” in our heads. Phonetics aside, they’ve come out with a new single and our Friday just got all that much better. The Scottish synth-pop trio teamed up with Japanese group Wednesday Campanella for “Out of My Head” and an accompanying cinematic anime video. The EDM/J-pop hybrid trio lead the way on the song, delivering its verses in Japanese. Lauren Mayberry then explodes into the chorus with her inviting and powerful vocals. Altogether, Mayberry and Kom_I—lead vocalist for Wednesday Campanella—complement each other’s vocals stunningly, making for an utterly infectious summer song. The video for “Out of My Head” was created by director Junichi Yamamoto and art director Yoshiki Imazu. Wednesday Campanella is made up of members Kom_I, Kenmochi Hidefumi and Dir.F; they made their debut as a group in 2012. Last year, the trio released Superman, their first album for Warner Music in Japan. “Out of My Head” follows on the heels of their acclaimed June EP, Galapagos. CHVRCHES are fresh off the release of their latest album Love Is Dead, released in May, and in the midst of a North American tour to support the LP. You can revisit those tour dates here. Watch the video for “Out of My Head” (or stream the track via your service of choice) and listen to Paste archival audio of CHVRCHES’ 2013 Daytrotter Session below.